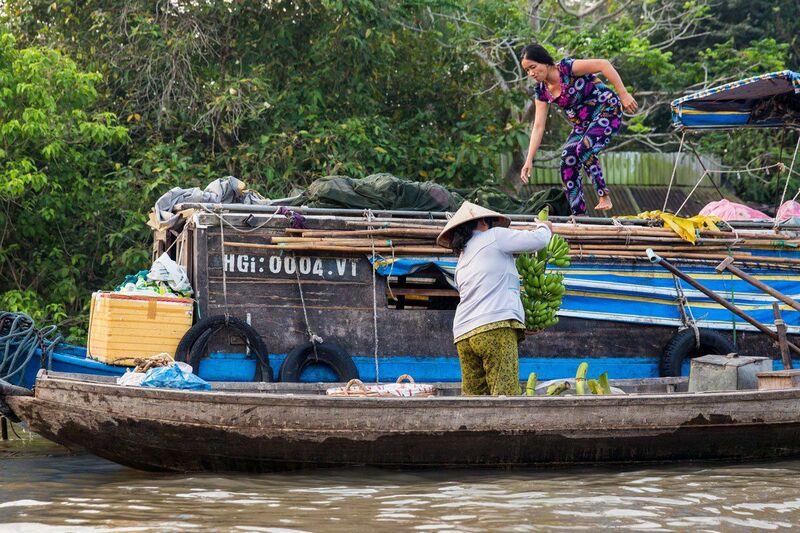 A trip to Vietnam would not be complete without a trip to the Mekong Delta. 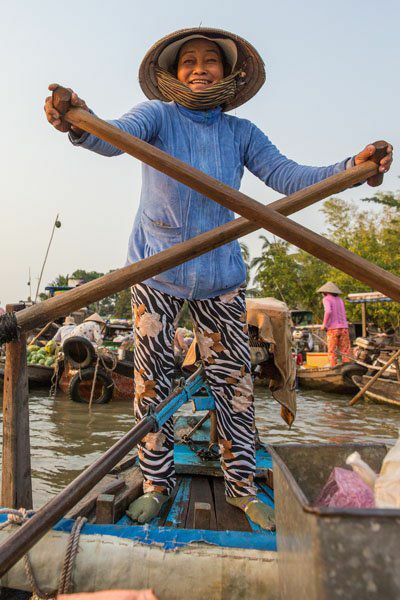 This is iconic Vietnam…flat fields of rice fields as far as the eye can see, wooden houses on stilts located along the river’s edge, men and women in small boats, selling their produce. 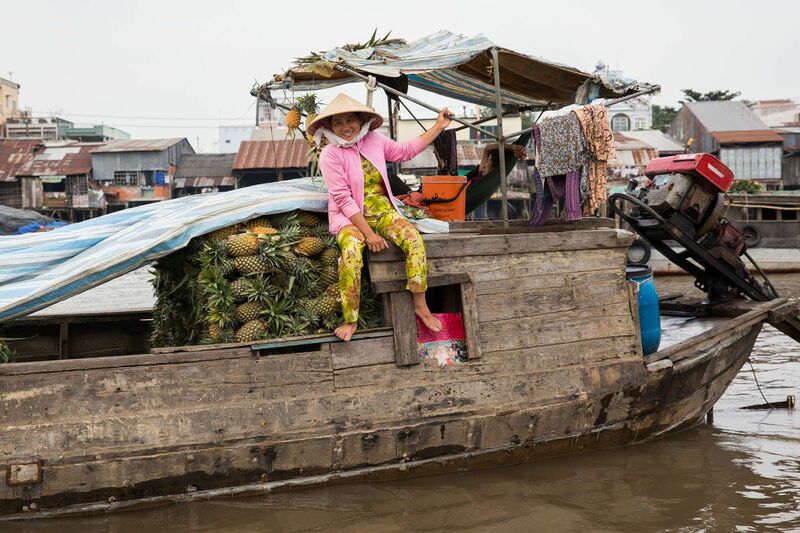 I was so excited to get a glimpse of this Vietnamese way of life and to have a chance to see with my own eyes the things I have grown up seeing in history books and photographs. 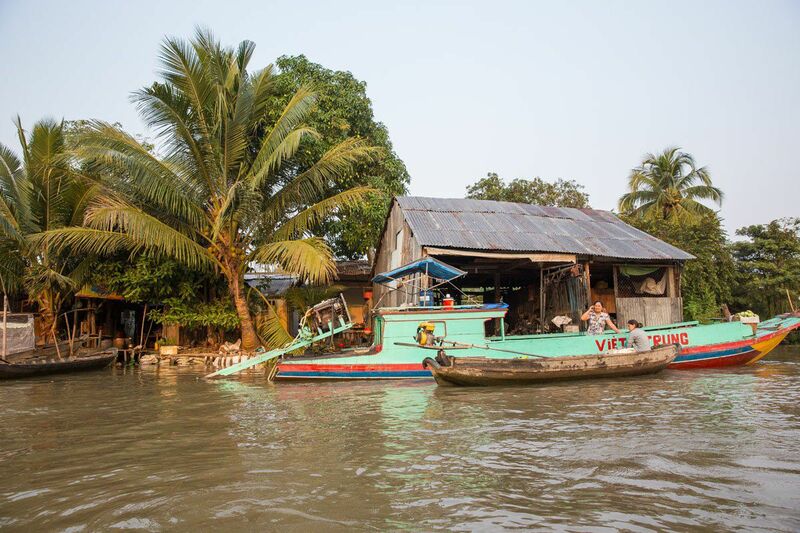 Our access point to the Mekong Delta was the small city of Can Tho. This city was easy to reach from Phu Quoc Island, just a half day ferry and bus combination trip. For two nights we stayed at the Nam Mon Hotel, a very basic hotel, but a hotel that is known for its amazing tour of the Mekong Delta. 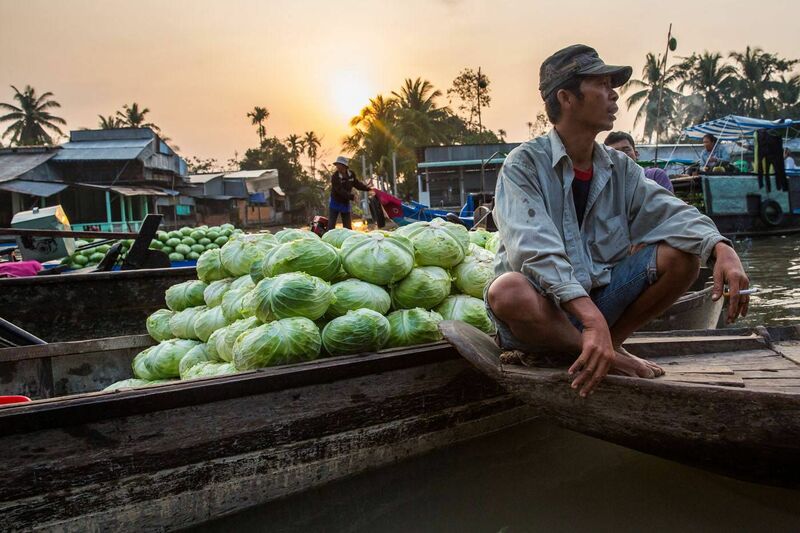 It’s an early start to the day in order to catch the morning floating markets in action. At 5 am, before the break of dawn, we met our tour guide in our hotel lobby. 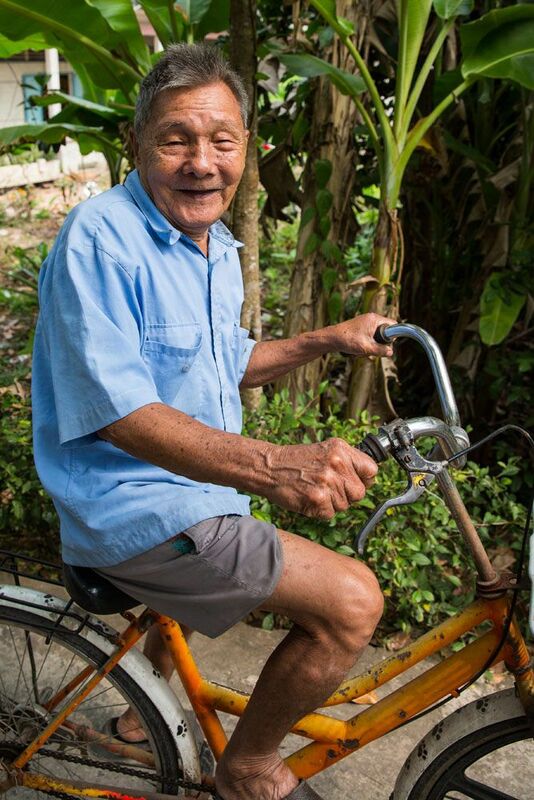 Phuoc (pronounced “foo”) was a twenty year old man who would teach us all about Vietnamese life on the Mekong Delta today. He was friendly, loved answering our questions, and quickly developed a fondness for Tyler and Kara. 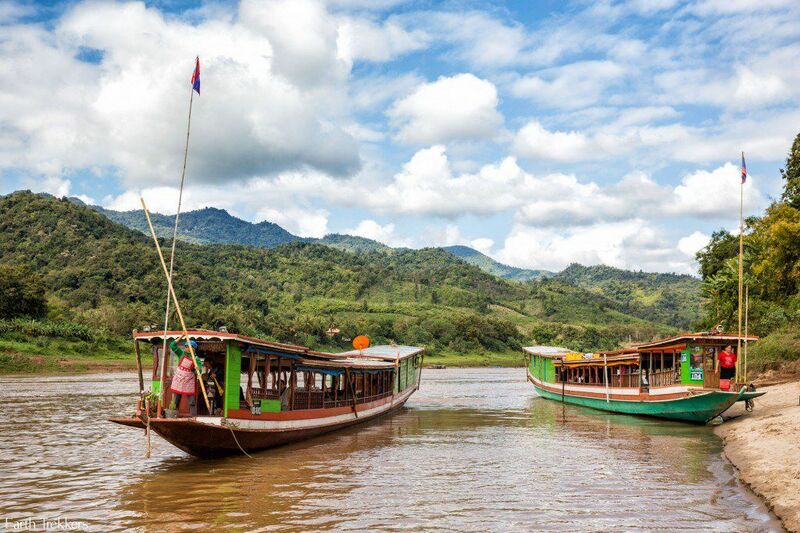 Phuoc showed us to the river, where we boarded our boat, a long wooden boat that was driven by a Vietnamese woman who always had a giant smile on her face. The four of us climbed into the boat, taking our seats on wooden benches, using life preservers for back cushions. And then we were off! 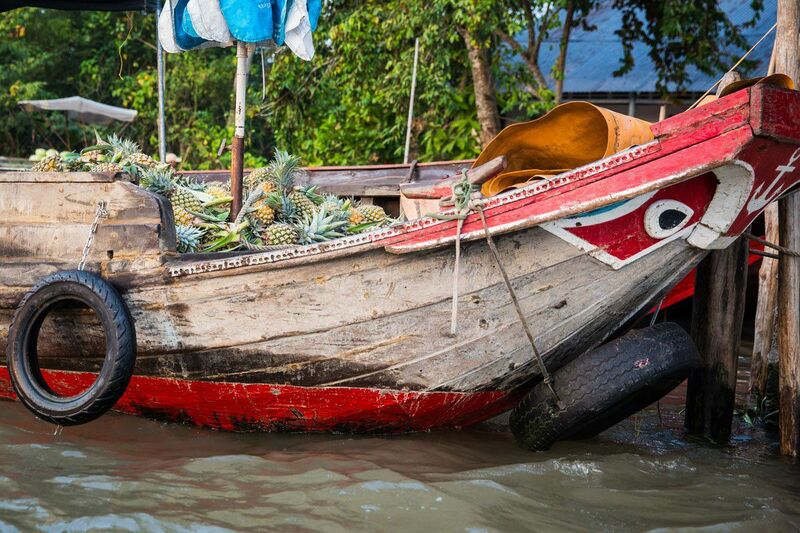 It took almost two hours to reach the floating market but our journey was not at all boring. In fact, it was fascinating. 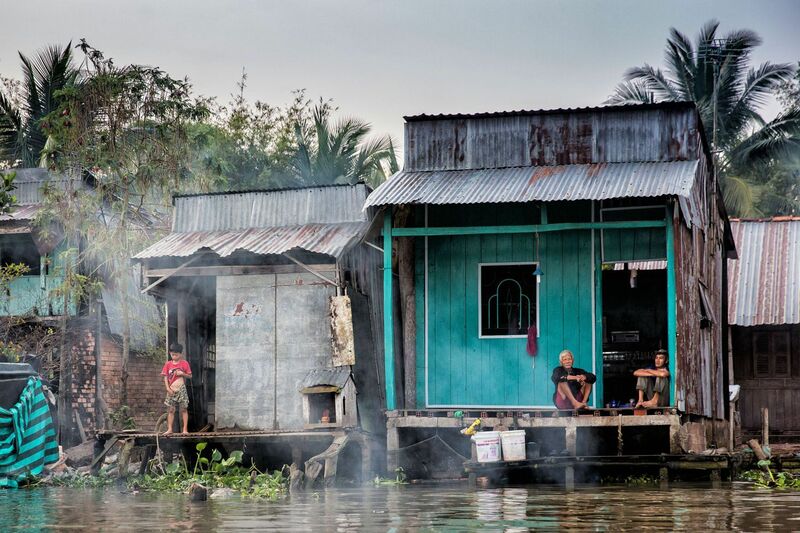 Houses on stilts lined the waterways and people were just starting their day. People were outside, brushing their teeth, bathing, washing clothes. Kids sitting outside waved to us as we passed by. We even saw one toddler boy peeing into the river. The sky began to lighten at 6 am and by 6:30 am motorbikes were on the move everywhere. Kids were going to school and parents were going to work. Here in Can Tho, kids only go to school from 7 to 11:30 am and then their day is done. 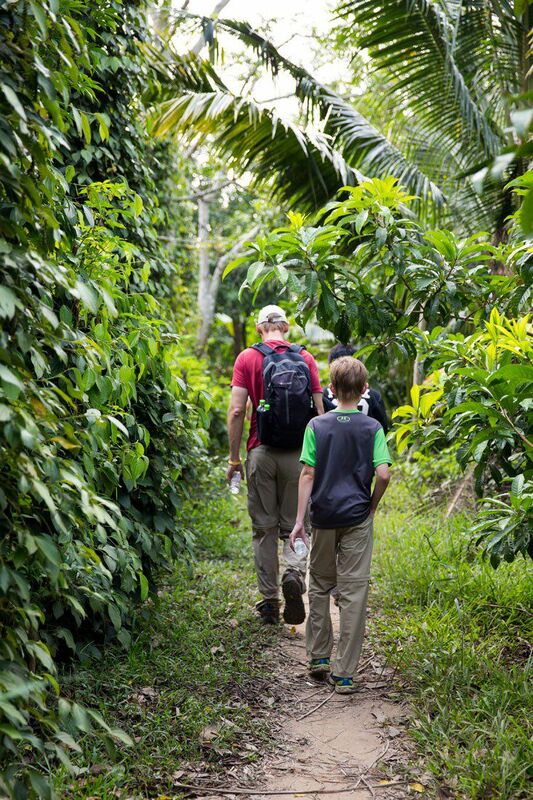 That’s a big change from Cambodia, where children were in school from 7 am to 5 pm Monday through Saturday! 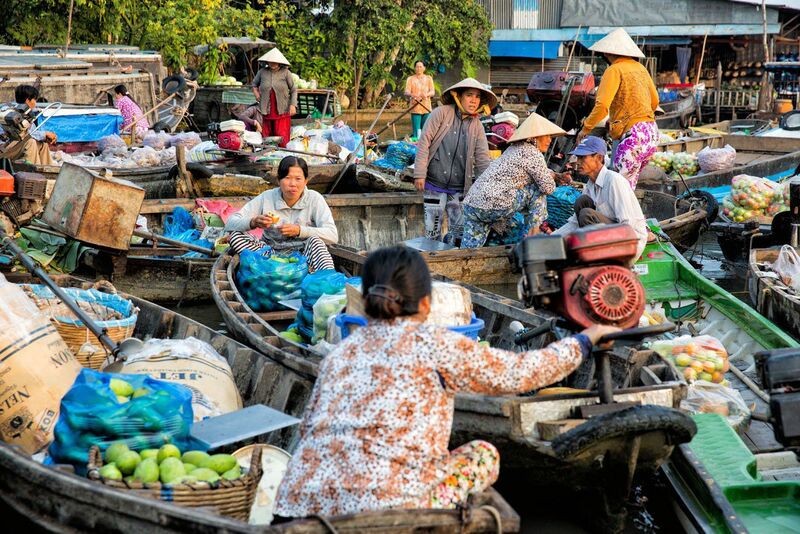 During our ride to the floating market, I asked Phuoc about what the Vietnamese think of Americans. 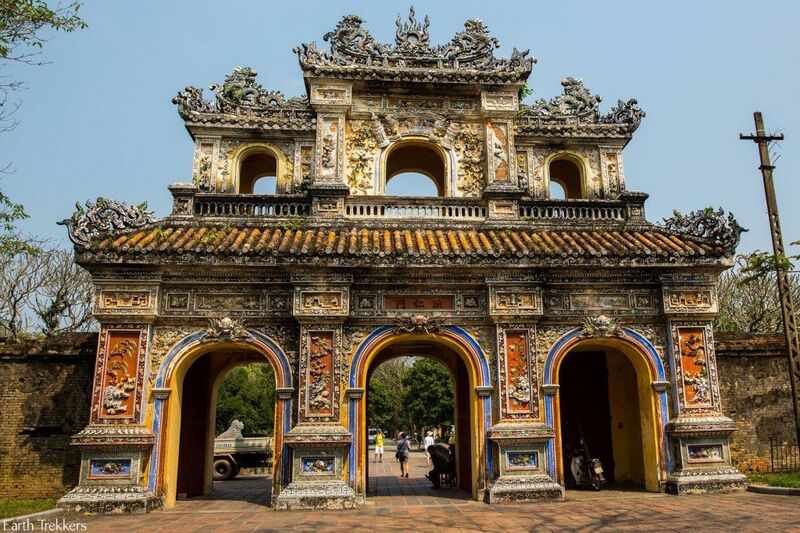 It has now been forty years since the end of the Vietnam War and I wasn’t certain if the Vietnamese still harbored resentment or anger towards Americans. Phuoc said that he loves Americans and most other Vietnamese share his thoughts. He said that Americans are friendly, polite, well-educated, and treat the Vietnamese with respect. While in Can Tho, many other Vietnamese people smiled and waved to us and genuinely seemed to appreciate our company. Having two cute kids helps a lot, also! Finally, we reached the floating market. This was a small market but much more intimate. Our boat drifted in among all of the others and we watched as people made their sales and purchases. Mostly it was women doing the buying and selling but there were some men getting in on the action as well. It was a very friendly affair. The women were smiling and happy, chatting with their friends, as they all knew each other. They smiled at us as well, and once again, Tyler and Kara were a big hit. 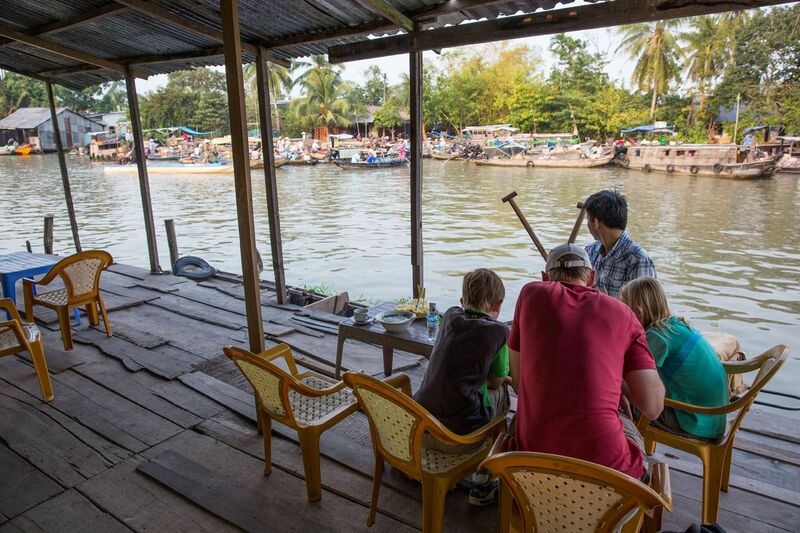 From a small building perched on the riverbank we sat and ate breakfast and watched the market. For breakfast we ate traditional Vietnamese soup along with pineapple purchased from the market. 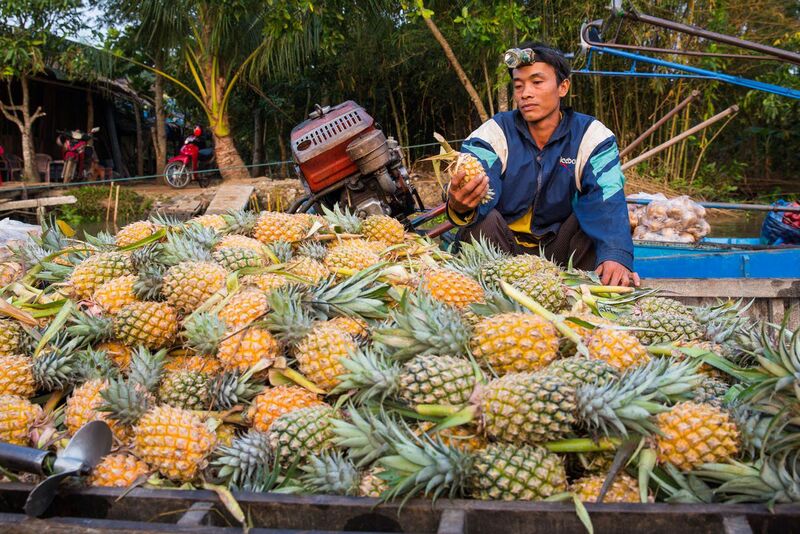 They have the best pineapple here! After seeing the market we cruised on the smaller canals. We saw more houses on stilts here and some really looked to be in bad shape. The houses were being held up by stilts made of concrete and wood. Many of the concrete stilts were beginning to bend and crack. I don’t know how old these houses were, but to me, it did not look like they would be standing much longer. 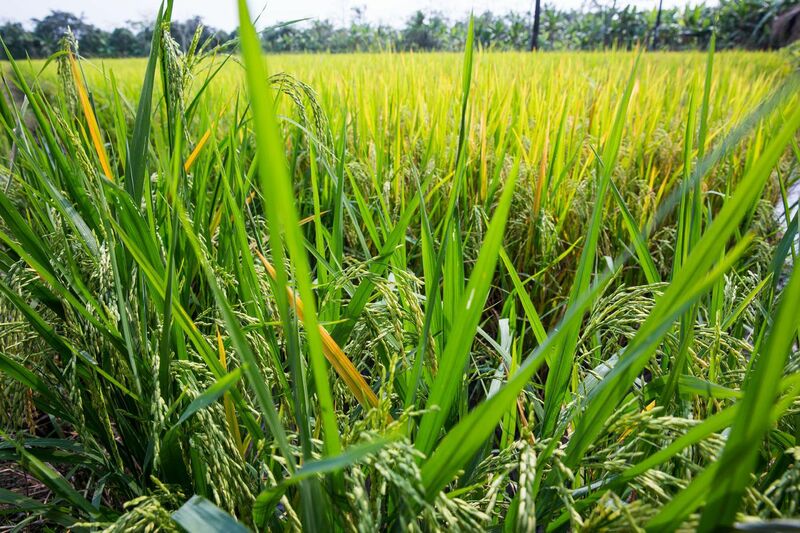 Later, we got off of the boat and Phuoc took us on a walk through the countryside. 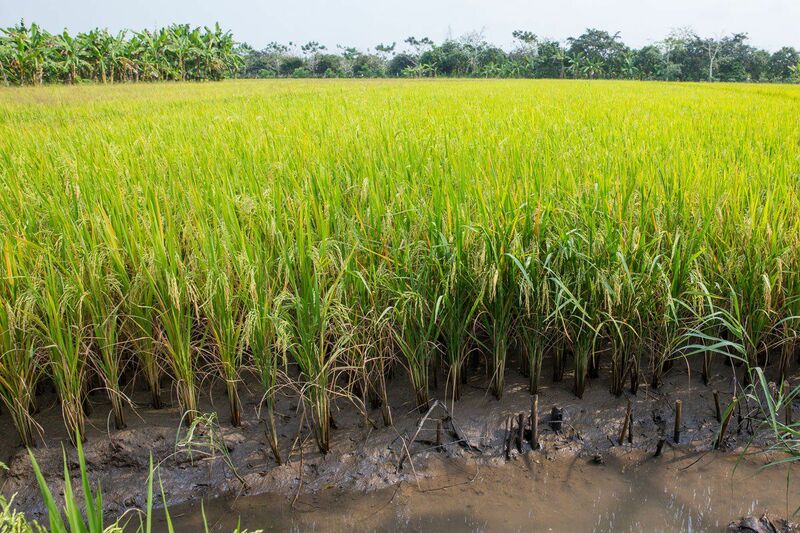 We got to see rice fields, walk under banana trees, talk to the friendly local people, and explore a fruit garden. What a beautiful place! 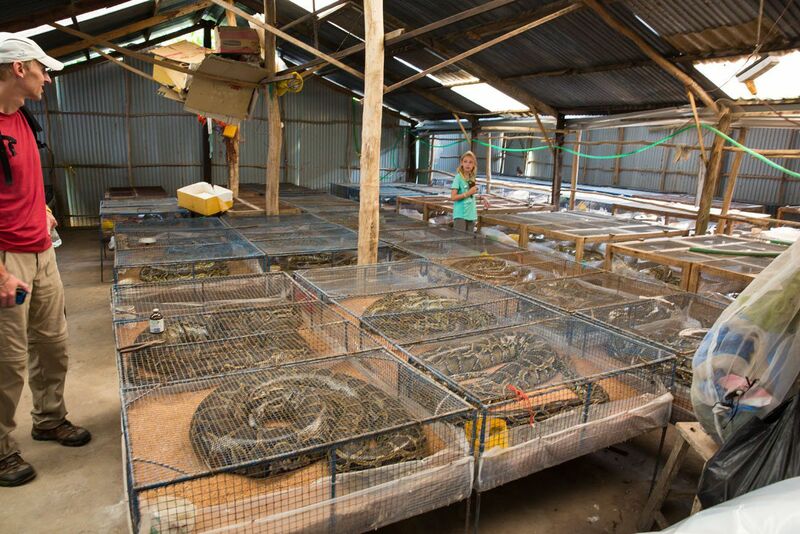 During our walk we passed a snake farm that dries and sells python snake skins. 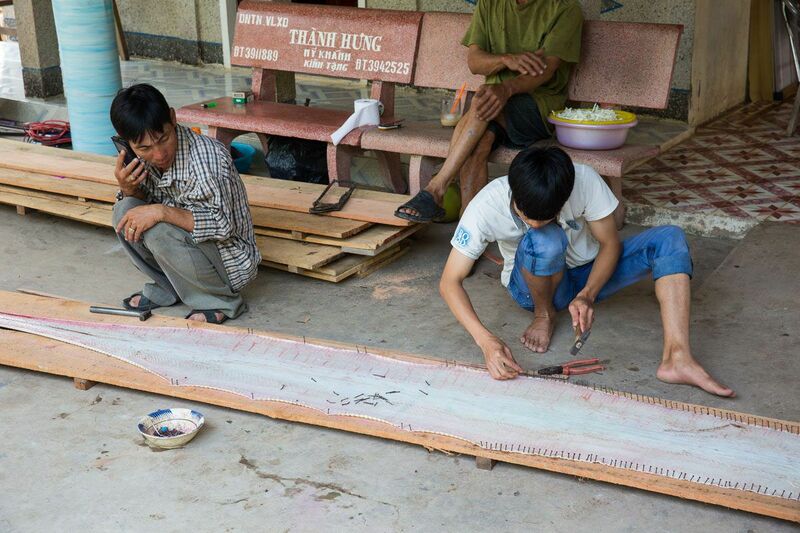 About ten to fifteen large snake skins were stretched out on planks and nailed in place to keep the skin taut. It smelled bad, like decaying meat, but I found it fascinating. I asked Phuoc if they had live snakes here that we could see and he said yes. The five of us entered a very large building housing well over fifty full grown pythons in small mesh cages. The room was warm and smelled unpleasant, like snake poop and uncleanliness. Each cage was approximately 3x3x2 feet and housed one to two pythons. Most were sleeping but others were poking at the cages, looking for a way out. It was fascinating and depressing at the same time. These beautiful animals are living in cages much too small for them, only to be euthanized in the near future so someone can have a snakeskin purse or shoes. But at the same time, even if I don’t agree with it, this is a way of life for the people who work here and a way that they can put food on the table for their families. By the way, we were the first visitors that Phuoc took into the back room to see the snakes; no one had ever asked to see them before. 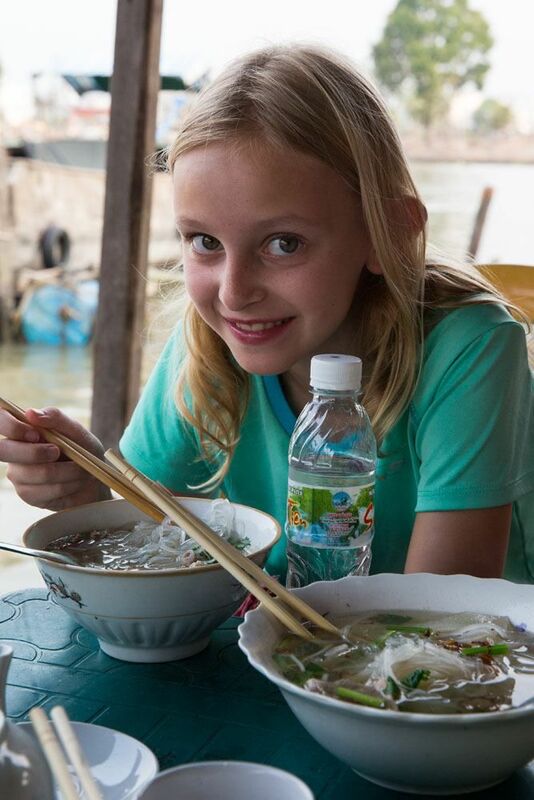 Before heading back down the river to Can Tho, we made a brief visit to a rice noodle factory, where we learned how rice noodles were made. 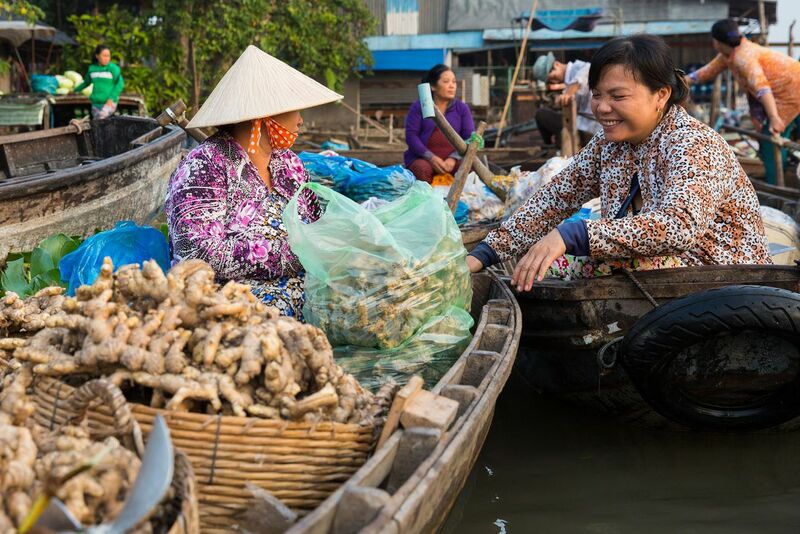 Then we passed through the Cai Rung Market, one of the largest daily markets on the Mekong Delta. Only today, it wasn’t so busy. 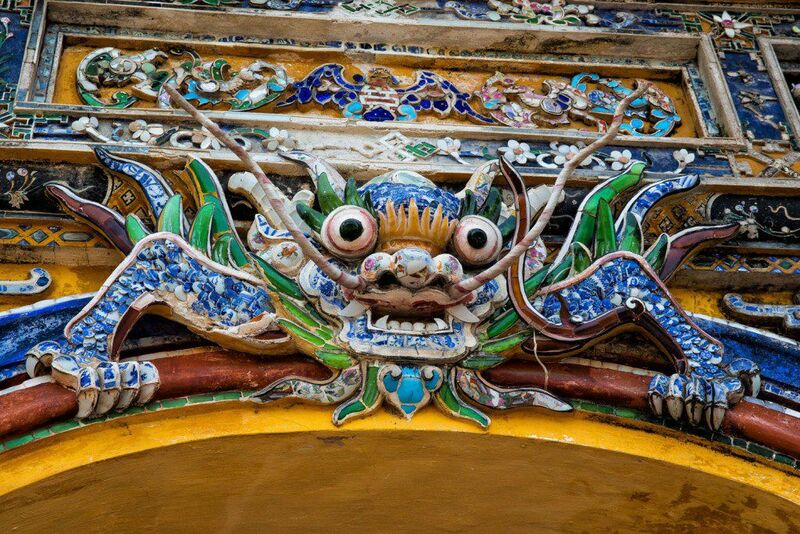 The lunar New Year, or Tet, is fast approaching, a time when people travel home to be with their families, and one of the most important holidays in Vietnam. Tet is still two weeks away but it is already having an impact on normal travel patterns. 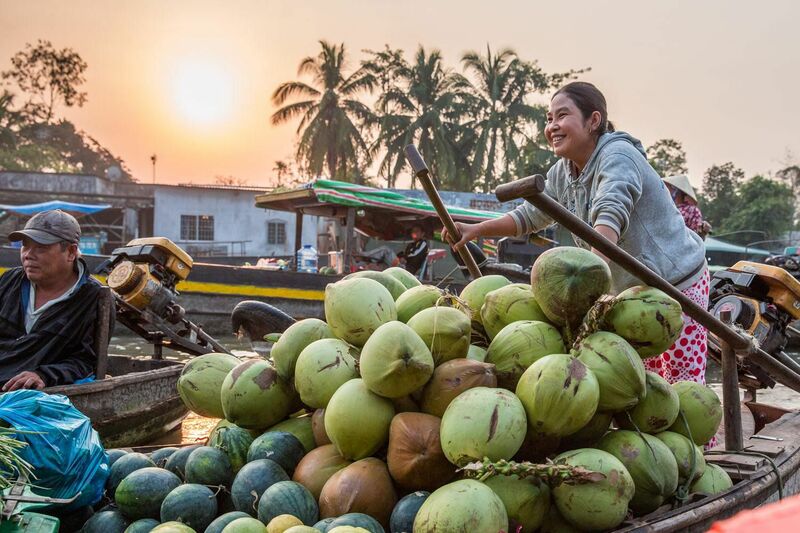 Most people who sell their produce here have already begun the journey home, making this market much smaller and much less lively than normal. 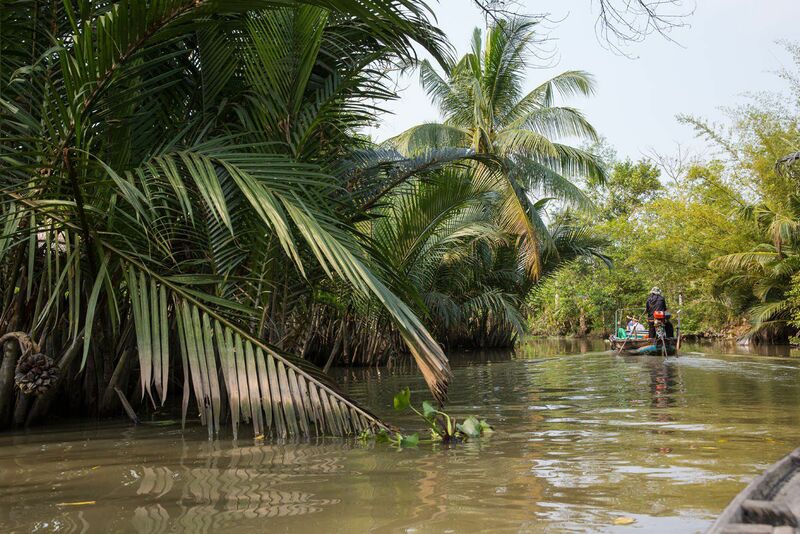 Our tour of the Mekong Delta concluded in the early afternoon. We bid farewell to our smiling driver and to Phuoc, thanking them both for an amazing morning and an amazing look into Mekong life. It is days like these that make me so thankful for the opportunity to be able to travel with my family and meet these wonderful people so far from home. 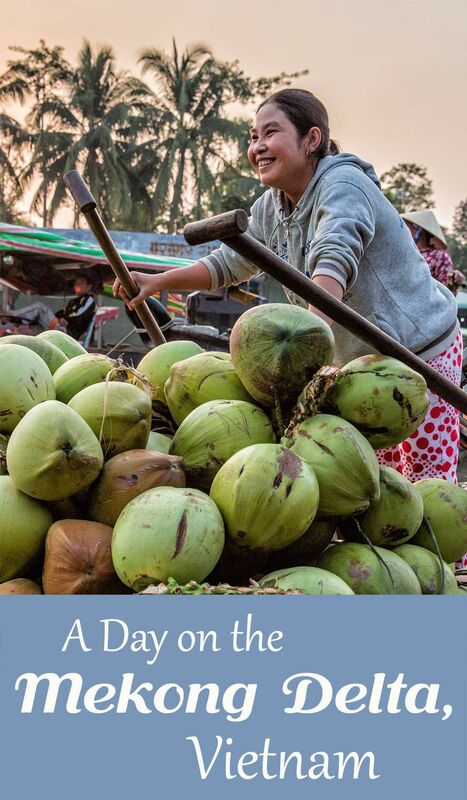 After reading it I just changed my mind about the day tour from Ho Chi Minh City and I will probably go for an overnight stay in Can Toh! Just a question: Do you think it’s possible to go back to HCMC in the same day of the tour? Do you remember at what time does it end? I saw they have a bus leaving every 30 minutes to HCMC, right? 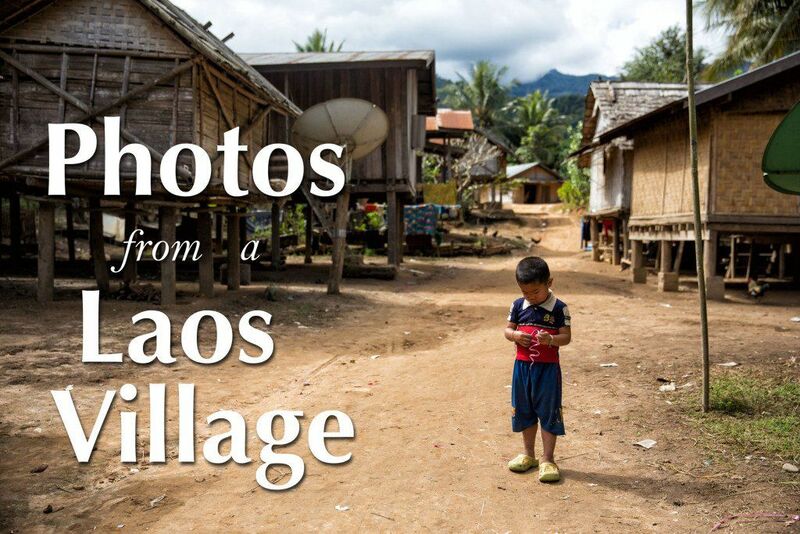 Great post and I love your photographs. 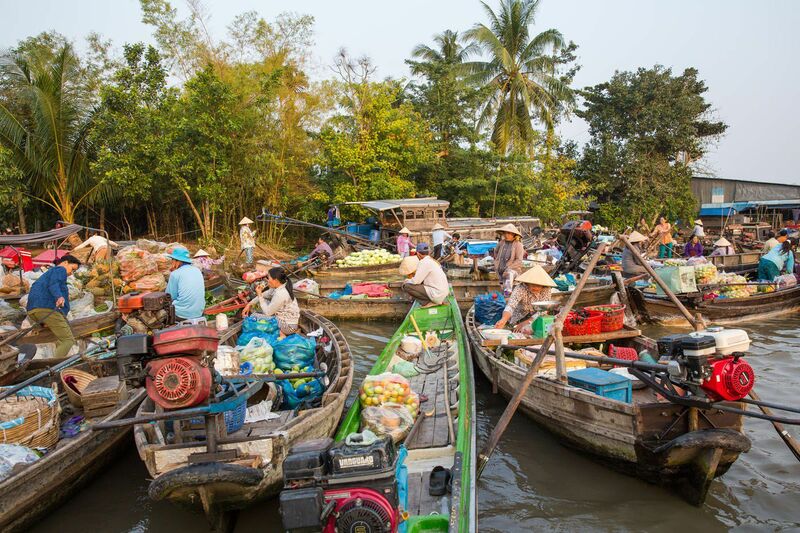 I was planning on going on a day tour of the Mekong Delta but after reading this post I think I’m convinced that an overnight stay is the way to go!